Although summer's far from over, I have already started to plan my fall/winter wardrobe additions. 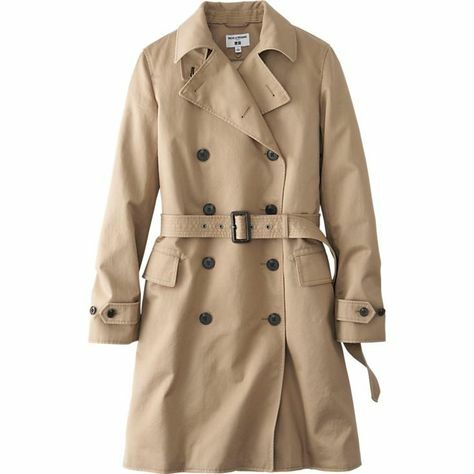 It'd be premature to add much before I've analyzed my office-wear needs, but I'm fairly certain of at least one unfilled niche in my closet: a work appropriate mid-weight coat for fall and spring, most likely a tan trench coat like the pictured one from Uniqlo. (You can see the same style, I think, pictured on another blogger.) Up to now, I've been relying on some of my heavier cardigans and a tweed moto-style jacket from Ann Taylor, though none of those items are quite as versatile or polished as a trench coat might be. I do have some reservations about whether a trench coat would be a good addition to my wardrobe. While they're frequently touted as a wardrobe staple, they're probably not equally suitable for all climates. In the last few years, I've personally found that NYC weather is prone to extremes that are not especially trench coat-friendly. If I remember correctly, we only get a small handful of comfortably balmy days in spring or fall before the weather progresses full speed ahead to summer or winter. The window for wearing a light coat is short. Separately, I'm not absolutely certain that double-breasted coats and jackets are always flattering on broader-chested figures. I only recently purchased my first single-breasted coat, and I was surprised that it suited me so well. Because the prototypical "classic" trench is typically a double-breasted style, I'd feel a little strange about buying a single-breasted one. It just doesn't feel as polished, I suppose. I think a single breasted can still look polished, but it's definitely more casual looking. I agree about trenches being either too warm or not warm enough--granted I live in S. FL and have absolutely NO need for trench coats. I used to wear one atleast once a week, until I stopped b/c of snide comments and I do admit now how ridiculous it was. So I downsized my collection. What about one that has a zip out lining, that way you can add warmth when it starts getting colder. I know Brooks Bros outlet does them in a tan or navy double breast--and they always have sales. You'd be surprised at how well a decent trench can hold up to more extreme weather. I wouldn't wear a plain cotton coat in a trench style in that weather by any means, but a tightly woven waterproof coat in something like gabardine is perfectly fine. Blocking the wind is a big part of staying warm, which is what a lot of the fashion trenches can't do. I'd echo Pret a Porter P's sentiment and find one with a liner for when the temperature drops. Between those points and layered clothes underneath, you should be able to make it to mid fall at least before you have to swap to a winter coat. Thanks for the recommendation and I will definitely check out Brooks Brothers! It's one of those stores that I generally feel like I should start shopping at, partially in the interests of upgrading my suit collection a bit. Thanks for the tips! I feel like it might take a while to try on enough styles to find something that fits fairly well off the rack (hopefully) and get a sense of what I like in terms of the spacing between the two rows of buttons. Uniqlo makes a really great trench, I love the one you pictured! I hear you on the double/single breasted issue. I'm looking to add a trench to my wardrobe soon and I think I'll end up with a double breasted version. I think they look great when left open, and if I know myself I'll be too lazy to button up most of the time. I had a (cheap) single breasted navy trench years ago when I lived in NYC and I wore it a LOT. I think you'll be pleasantly surprised at how often you get to wear it once you find the right one!